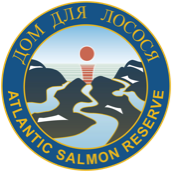 Russia’s magical Northern Rivers within the Atlantic Salmon Reserve include the Kharlovka, Eastern Litza, Rynda and Zolotaya. They are considered by many to be some of the very best Atlantic Salmon rivers in the world today. They are all intimate and very unique in their character and size ranging from the challenging spring waters of the mighty Kharlovka and Litza to the charming summer pockets and pools of the Rynda and Zolotaya. While the Rynda river tends to produce almost as many salmon as the Kharlovka and Litza rivers combined they all have one special quality in common – the Northern Rivers are known for their Big Salmon! Every season the rivers produce hundreds of big silver salmon larger than 20 pounds. To be exact – Over the last 2 seasons 17.6% of the salmon were 20+ pounders! The rivers will also produce more than 30 serious salmon every season that are greater than 30 pounds, in addition to a couple of serious monsters that are landed in the 40 pound class! Nobody said it was going to be easy though. For every serious salmon that makes it to the guides net, their are countless sad stories about the Big ones that got away. We do not allow fishing from boats so it is up to you and your skilled Russian guide to contend with the many challenges including the massive boulders and the powerful rapids that loom below almost every pool. 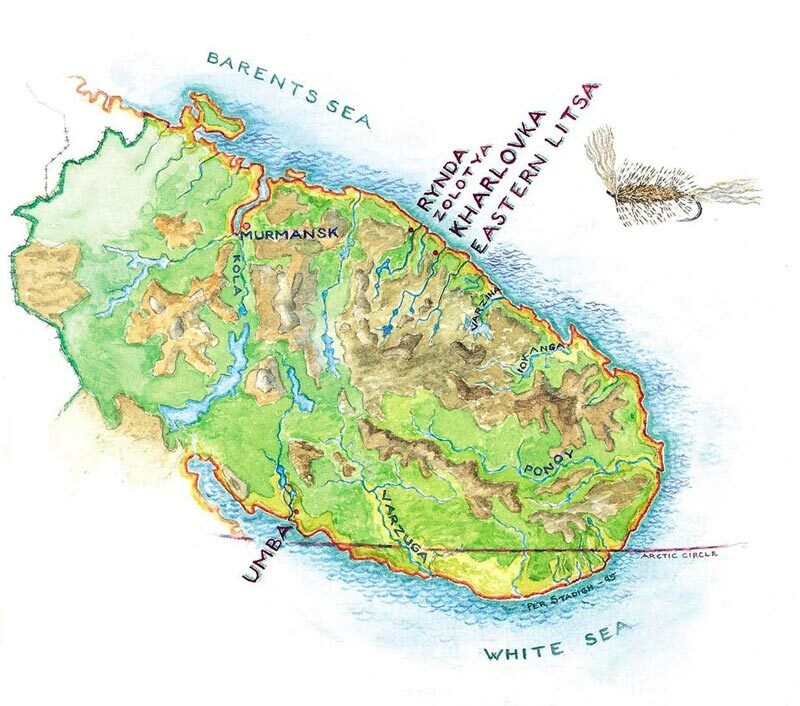 The northern coast of the Kola is extremely remote and unspoiled by human intervention. With large silver salmon on the run from early June through September, the Northern Rivers are a dream adventure for anglers young and old. The ASR with its Big fish have captured the imagination of many fly fisherman. The adventure they can provide are reflections of our lives and the memories can be endless. June is when things really get going on the Northern Rivers, like in Norway, this is the month ruled by big sealiced fish. Nowhere is this truer than on the Kharlovka where fresh run salmon are caught in good numbers already from the ice out. Up north the transition from late winter into early summer is ever so rapid. Here ‘spring’ can be a matter of hours. The bright midnight sun lit nights, full of innumerable swans, geese and waders that are flying the last leg to the nearby breeding grounds, make the setting magic. Everything alive is determined to take full advantage of the short window in winter that we call summer. By early June, a good head of large fish is certain to be found in the lower reaches and that is when our season opens. On both rivers we can fish the entire length from the very surf up to the Fall’s pools. In a normal year few fish make it to the uppermost reaches prior to early mid-month. This means that much of the first fortnight is a matter of the lower rivers holding back good numbers of large multi-sea winter salmon. Kharlovka also is blessed with what has been called ‘The finest Home Pool in the World’. Given the rapids before and after the pool even the largest of fish will rest a while here. The rivers can be swollen and brutal in early June. But the huge fish are there and then in a way are easier to catch than later on when they are spreading out over the river. Now they are tucked into sheltered pools or hold just under the bank in the swifter ones. I rank this as the finest time of them all. The fish are big, aggressive and sealiced. The sensational feeling of hooking into a rock hard +25 pound salmon on a short line, seconds before he explodes out into the powerful flow to disappear in a 100 yard long screaming run is unsurpassed! The Litza shares the same pattern. In the last week of June the water levels have gone down to make for easier wading and the temperatures are such that floating lines and lighter sink tips often fare best. In late June/ early July a fresh push of very large males often arrive. With these mixed in among earlier arrivers and more moderate fresh run summer salmon, anything can happen. As the Kharlovka falls still will keep the run back the upper river is stuffed with large fish. A month that very well might have started with some ice and plenty of snow by now has turned into full summer. The birches are green and the reindeers arrive in thousands along with the first odd grilse. 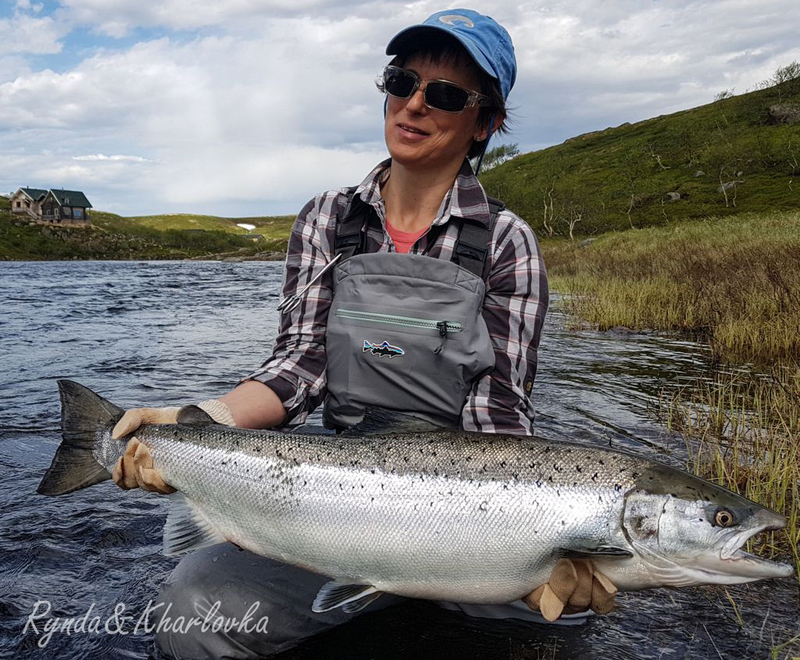 It is full summer on the tundra and nothing could be better than to cherish the search for Atlantic salmon in such a complex and mind bogglingly beautiful surrounding. In most years there still is a good amount of water in the first part of July. In a later than normal year the first week in effect fits well with the June description. Accordingly it also is highly sought after. Fish run in good numbers with a fair share of grilse starting to show up. Normal methods employing doubled handed rods and medium sized flies do well. The North Americans swear by this week as they are certain to take full advantage of single handed rods, while the big fish still run in earnest. This is also when the upper Litza really starts to come alive. In the second week of July the rivers should have dropped a good deal, to eventually reach the lower levels associated with summer. In combination with Bombers these surface oriented methods by now often are suggested by our cunning Russian guides – they like no fuzz and only suggest what works – their pride relies on your catch!! For many, these weeks in reality would be the most suited ones – the pools are well stocked and far easier to approach than earlier in the season. In July and August the conditions can be compared to the best Icelandic ones, with the only difference being that here we are covering fish of 25, 35 or even 45 pounds on any given day. In the middle of the summer the Kharlovka/Litza are simply two of the World’s finest medium sized clear water rivers for Atlantic salmon. Sometime in late July the largest and fittest of the Kharlovka salmon run through the falls. Once we are certain that a good head of fish have gone through, we open up the fishing on the upper river. The area is so pristine and of such extraordinary beauty that we named it ‘Kharlovka Park’. It is very likely that this is the last serious ‘big fish’ river section on the Kola Peninsula that remains almost never fished. Something tells me that new records will be broken there!! Fresh summer salmon and grilse will pour in well into August, stirring the resident stock up. As the season advances one will find that the steeper and more turbulent Litza gives more available fishing than what the Kharlovka does. On the Litza all migration is blocked by the falls making for an amazing accumulation of fish from the Fall’s Pool and down. Aside from all the named pools there are hundreds of smaller lies to be searched through. In mid- late August the cooler weather and the darker nights starts to bring water temperatures down. The resident stock becomes more alert and even the largest males are getting aggressive. Almost always are the record sized fish caught at this time. As a wonderful bonus the elusive ‘osenkas’- start their run. These are salmon that have a strategy to spend a full winter in the rivers not to spawn until the coming autumn. They run from August up to freeze over. To survive all these extra months in fresh water they arrive in a fantastic condition, even plumper than an early springer with the same size range of 12 lbs to 35lbs plus. We never get too many, but those we get easily are the most appreciated of the season. Big, bright and brutal! Spring: The fishing begins on the final days of May – early June. Big fresh springers up to 40+ lbs (average 20 lbs) and kelts on their way back to the sea. Water levels can be high with the salmon moving up along the banks and slower side pockets. Water temperatures in the spring usually range from 1 to 8 degrees C. Main spring fishing areas are on the lower beats of the rivers. Primetime: Is from mid-June to mid-July, when the main run of MSW-salmon is on. They are average 15+ pounds with many opportunities for the big 30-40 pounders. Water levels are dropping back to perfect levels with temperatures in the range of 7 to 14 C. Salmon are now starting to stack up through the upper beats of all rivers. Summer: Runs through mid-July and early August. Grilse start running mixed with 2SW salmon. Many summer weeks we will still land fresh salmon up to 20 pounds. Water level is dropping, with the all the beat fishable. Water temperatures can range from 10 to 20 degrees C.
Autumn: Is from late August through mid-September. Large colored spring salmon start to become active again. Osenkas or big bright autumn fish start entering the rivers average size is between 15 to 30 pounds. Water level is at the lowest mark, rains induce spates. Water temperatures are approximately 10 degrees C. Fishing can be great through all the upper and lower beats.